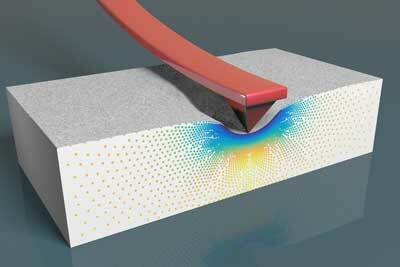 (Nanowerk News) Piezoresponse force microscopy (PFM) is the most widespread technique for characterising piezoelectric properties at the nanoscale: i.e. for determining the ability of some materials to generate electricity when they are subjected to a mechanical stress and, at the same time, to deform in response to a voltage. Piezoelectricity is used in a wide variety of applications: pregnancy ultrasounds, injection motors, sensors that measure deformations, actuators or sonar, among others. Piezoresponse force microscopy not only determines whether a material is piezoelectric, but also its degree of piezoelectricity, and it is particularly important for applications of these materials in microelectronics and nanotechnology. Now, a team of researchers from the Laboratory of Computational Methods and Numerical Analysis (LaCàN) at the Universitat Politècnica de Catalunya · BarcelonaTech (UPC) and the Catalan Institute of Nanoscience and Nanotechnology (ICN2) has theoretically and experimentally demonstrated that the PFM technique can generate false positives when the piezoelectricity of a material is measured at the nanoscale ("Converse flexoelectricity yields large piezoresponse force microscopy signals in non-piezoelectric materials"). The PFM technique can generate false positives when the piezoelectricity of a material is measured at the nanoscale due to flexoelectricity. The PFM technique consists of applying a voltage to the surface of a material via an electrically conducting tip in an atomic force microscope, AFM. The microscopic tip itself detects the deformation of the material in response to voltage; the piezoelectric coefficient is obtained dividing the deformation by the voltage. The researchers show, however, that the application of a voltage with a nanoscopic tip can generate deformations in any material, whether or not piezoelectric. In other words, any material measured with a piezoresponse force microscope gives a non-zero piezoelectric coefficient, even if it is not piezoelectric. The cause of this curious behaviour is flexoelectricity: a phenomenon that occurs at the nanoscale, whereby all material emits a small voltage when an inhomogeneous pressure is applied to it or, vice versa, it is deformed when an inhomogeneous electric field is applied to it: that is precisely the kind of field generated by microscopic tips. Flexoelectricity may not only make a material look like piezoelectric despite not being so, but can also alter the piezoelectric coefficient of the materials that are indeed piezoelectric. This has very important consequences for the characterisation of piezoelectric devices in microelectronics: the results imply that, from now on, measurements made with PFM to characterise the materials in these devices should take into account the effect of flexoelectricity.